The social network Facebook is testing a new redesign and our profiles. For web umpteenth company prepares changes that could see the light on Thursday, the date on which Facebook has summoned the press to present "a new look in the News Feed" (this is what we read in the invitation). These changes have already been reflected in the profiles of some users in New Zealand and now we can see the timeline of our profiles appear to be better organized and presented with a cleaner design. This implies that, probably, the Facebook application for iOS devices also undergo similar changes. The Techcrunch Web ensures that the look of News Feed on iOS devices undergo a radical change and give special prominence to the ads (hopefully to be confirmed this news to begin with criticism). According to the editor of Techcrunch, who claims to have seen the redesign of Facebook on a smartphone, the application starts to separate the News Feed into two sections: one shows the states of the users and the other pictures. On Thursday will clear the mystery. 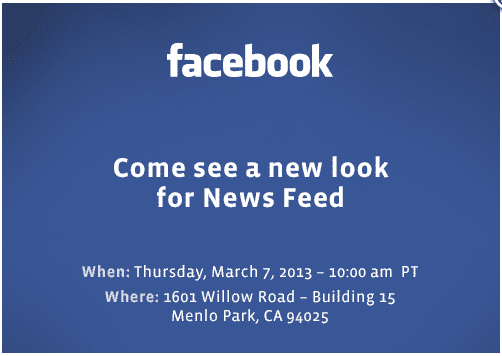 Article Facebook prepares design changes (yes, again) was originally posted in News iPhone . I would love to see another Facebook redesign - I love change. I have just got my new phone with the help of The Box Zone and everything is so different on here - I love it!